WOW! Crazy Zinnia Kinetic Sculpture Illusion! I’ve seen some pretty crazy sculpture optical illusions since I’ve been doing this, but this one really takes the cake! 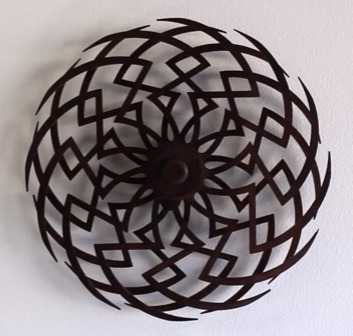 This kinetic sculpture optical illusion is sure to blow your mind! At first glance, this looks like a typical sculpture, doesn’t it? It’s pretty cool, but nothing spectacular, right? Wrong! When the wheel of the sculpture is spun, it creates quite the trippy optical illusion, no? Imagine what fun you could have with guests if this kinetic sculpture illusion was in your house! Well, the good news is, you can have this awesome moving sculpture in your home. You just have to build it yourself from some woodworking plans by Clayton Boyer. If you liked this kinetic sculpture optical illusion, you might also want to check out this absolutely amazing 3D art! Prev WOW! How to Draw a 3D Hand!